Uh-oh! Things are getting nasty in Teen Momland! 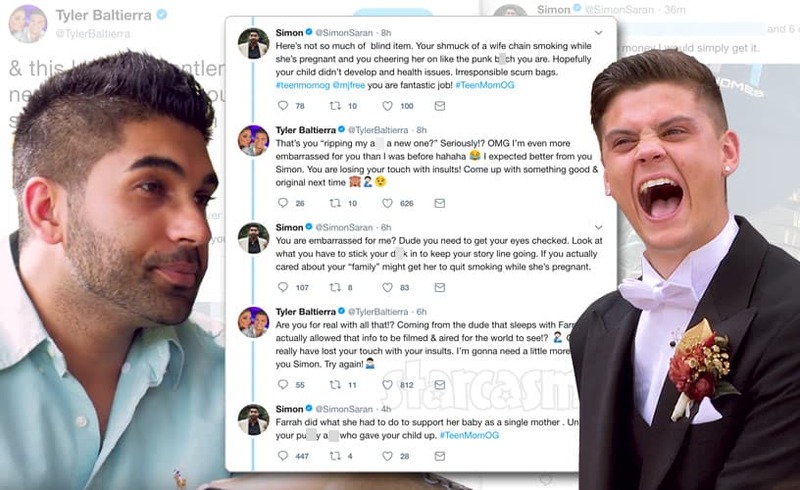 While most of the girls from the Teen Mom franchise usually stand in support of each other, a clear divide has been drawn between Farrah and everyone else. Catelynn Baltierra, Amber Portwood, and Maci Bookout took a break from filming the Teen Mom OG after show this past weekend and joined Kailyn Lowry for a book signing at a Barnes and Noble store. After their work was done, the girls got together for dinner and drinks. Missing from the group was fellow Teen Mom OG star Farrah. Despite her notable absence, she was still very much a part of the conversation. In a video clip captured on SnapChat, the gals are heard talking about “hoes” just before bringing up Farrah’s name. While the audio is hard to make out, it’s clear they aren’t offering up compliments. After Farrah caught wind of the girls banter about her, she retaliated via a nasty Instagram/Twitter post calling her co-stars fake, trash, and pathetic parents. I wouldn’t want this recorded either Maci! Thanks @okmagazine & Your welcome Loser’s I work with for the money I allow you and your kids to get-this is why your #fake #trash #patheticparents Thank God I have better things to do then this with my time? ?#RideMyCoatTails I can’t believe Catelynn, Maci, Amber, Kailyn said this about me! Love her my boo Amber ??? No word yet from Catelynn, Maci, or Kailyn regarding Farrah’s ill-tempered mud-slinging. Amber, however, did respond to Farrah’s post by attempting to neutralize the situation and claim it was nothing to overreact about. Farrah’s bitter response comes just days after another run in with a fellow Teen Mom alum Leah Messer. It all started when Leah posted a Tweet that some argue was a passive aggressive dig at Farrah. These girls–or should I say Farrah?–sure know how to get people talking in anticipation for the upcoming season of Teen Mom OG, which premieres on Monday, January 4 on MTV. UPDATE – Farrah’s dad Michael Abraham has now chimed in on the feud, and there’s more from Catelynn too! Just click the link!